I was in Austin last week speaking at a conference, and I had an interesting conversation with one of the other speakers. It’s a guy I’ve known for years on the web writing circuit. He started off saying how he had always felt as if he’d missed out for not starting a high-powered “disruptive” startup, especially back during the initial dot-com era. He came to realize, however, that he never actually wanted that. Now, he has a collection of profitable affiliate sites and online courses, plus paid speaking engagements — and most importantly, a happy life. The question is, what’s wrong with that? Nothing at all in my opinion … it seems pretty smart to me. So, when the question of “lifestyle business” versus “big ambitious company” came up from an Unemployable listener, Robert and I decided to tackle it. You’ll also hear about applying an audience-first model to the real estate industry, with a live example. Plus, we expand a bit on some of Michael Stelzner’s advice from our recent chat about the state of social media marketing in 2017, and how we’re testing a new approach on Twitter. Brian Clark: This episode of Unemployable is brought to you by StudioPress Sites, the innovative solution that gives you the ease of an all-in-one website builder with the flexible power of WordPress. It’s perfect for bloggers, podcasters, and affiliate marketers, as well as those selling physical products, digital downloads, and membership programs. Check out all the amazing features today at StudioPress.com. Voiceover:Welcome to Unemployable, the show for people who can get a job, they’re just not inclined to take one, and that’s putting it gently. In addition to this podcast, thousands of freelancers and entrepreneurs get actionable advice and other valuable resources from the weekly Unemployable email newsletter. Join us by registering for our free Profit Pillars course, or choose to sign up for the newsletter only at no charge. Simply head over to Unemployable.com and take your business and lifestyle to the next level. That’s Unemployable.com. Brian Clark: Hey there, everyone. 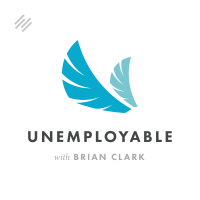 Welcome to the Unemployable, the show for savvy independent businesspeople like you. I am your host, founder and CEO of Rainmaker Digital, Brian Clark, joined by my esteemed co-host, Robert Bruce. Robert, how’s things over there in Oregon? Brian Clark: The undisclosed location in Oregon, I should point out. Robert Bruce: Yeah … Why would you do that to me? Brian Clark: It’s a big state. It’ll be hard to find you. Robert Bruce: There’s a lot of places to hide here. We just had record rainfall. In my pre-recording preparations I heard on the radio we had record rainfall for February, all-time. I felt it. I think it’s time for a move to South America or something. Brian Clark: Today’s Further did have a piece on Santiago, Chile. Santiago, I should say. Brian Clark: We know some other people that are hiding out in Chile, but I won’t mention their name. Robert Bruce: Yeah, right. You’re in the People’s Republic of Austin right now, is that right? Brian Clark: No, I’m back in the People’s Republic of Boulder. But I was in Austin for a couple of days, and as soon as we hit the end of this recording I’m getting on a place to Los Angeles. I usually don’t travel this much. I am not good at it, still, to this day. It just makes my life chaos. Robert Bruce: I’m going to say it right here because you can’t get too mad at me. You owe me some copy, man. Brian Clark: I know. I’m behind. Robert Bruce: You see how that works? Brian Clark: I’ll be on the plane, writing your damn copy. How about that? Why don’t you write it, Robert? God. Robert Bruce: Garrett and Jerod are going to love that one. All right, okay, you’ve got to get on a plane. Let’s get on with these questions. You solicited questions on Facebook again. Thank you everyone who asked over there. Let’s do some more asking for the coming weeks. Of course, you may have some interviews dropping in here as well. Let’s start it off with Bob. Bob asks — he thinks he knows your answer, Brian, but from your experience, if you could build a lifestyle business rather than what you’ve built now, would you? He sets it up by his feelings of intimidation when he thinks about building a business the size of Rainmaker Digital. He feels like he aspires more to a “lifestyle” business. Brian Clark: Yeah, that’s a recurring theme on this show. The old, “freedom is more important than money and status,” which I still firmly believe, although we do our best to make a lot of money. I think we enjoy it. The whole topic of the lifestyle business — it’s humorous to me. I saw an article that I clipped for the Unemployable newsletter that many people turn to freelancing even if they make less money, because it’s a better life. Of course, we know plenty of solopreneurs out there who leverage technology, virtual staff — all of these things to create a great business, but also to create the life that they want. And I think that really comes down to it. I think the only reason people would even ask this question is because of this incessant hype about the “go big or go home” startup culture. Robert Bruce: That’s interesting. What’s that number? Brian Clark: Over about 75 grand. That’s the key point where you have enough money to have a nice life. If you keep working harder to make more than that and you’re not necessarily in a job you enjoy, you’re really diminishing your life by trying to make more money. That coincides with what I always say, which is, “If you love what you do and it makes money, then great, that’s awesome.” But I think you know me well enough to know that I wouldn’t get up in the morning and do the stuff we do if it were just about the paycheck. Robert Bruce: Yeah. In one sense it has to be, because we all have bills to pay, of course. That’s just what it is. I don’t think anybody listening to this wants to live in their mother’s basement. Those days are long gone and you’ve got to get on with it and be an adult. But yeah, past a certain point — and in the incredible freedom that so many of us live in, and the ability to whatever degree choose the kind of work we want to do … This whole thing about “go big or go home,” building this massive billion-dollar … Trying to be Mark — Zuckerberg keeps coming back into this, man. I got to quit saying that guy’s name. I find it funny that in the however many thousands of years of human existence, that all businesses have been small. The vast majority, at least. This idea that certainly there were things that popped out here and there, but even for incredibly ambitious people, it was the mom and pops, it was the stall at the ancient marketplace, it was the blacksmith’s shop. It’s always been about small business. This idea that there’s something wrong with that, or you’re not big enough or you’re not smart enough, it’s just ridiculous. You’re joining a long parade of the rest of the history of humanity. Brian Clark: You bring up a good point. There are people who say, “Well, if you never raise money, you’re a lifestyle business.” Or, “If you make a profit, you’re a lifestyle business.” We do all of this stuff. We’ve never taken money. That’s ridiculous. The connotation of lifestyle business is you’re taking it easy, but we work hard, right? Brian Clark: We make eight figures in revenue, so we’re almost escaping the definition of small business just on revenue. We’re definitely small, because we’re only 65 people. That would be cool if you could break the revenue ceiling before you broke the people ceiling. Brian Clark: But that’s beside the point. There are some who would still say, “Well, you’re still a lifestyle business because you’re not reinvesting every dime to grow super fast to cash out.” Again, that’s being driven by money more than what you actually do, so that’s not for me. I’m sure you know there are plenty of small business people who work their asses off too much — for too little, oftentimes — and their lifestyle isn’t all that great. To answer Bob’s question directly, I would think of it in terms of lifestyle design, where the type of business that you create fuels that desired lifestyle more than it is, “I’ll do whatever it takes to make a certain amount of money.” For example, if we did cash out of Rainmaker Digital and I go do something else, you can bet I will never do this again. I’m getting up there and I want to travel. But that’s the beauty. I think I could make low seven figures with a “lifestyle business” if I did it correctly, which would allow me to travel and work from anywhere and all of that stuff. If that’s what you want to do, then that’s what you should do. Remember, I had to talk myself into doing what we’re doing now. Remember, back in 2010 I could have kept all those separate businesses. I could have sold them off one-by-one if I was really motivated and accumulating capital gains-level wealth. But no, I did what I wanted to, and that meant merge everything together and, “Let’s get a real team and do great things.” I’m doing what I want to do, Bob. You do what you want to do. There is no shame either way. Don’t let other people’s definitions affect you one bit. It does not matter what anyone else thinks except for you, your family, and your customers or clients — whatever your model is. Robert Bruce: Dan asks about the concept of being a media company first and a seller of your specific products and services, and/or services second. He’s looking for some good and bad examples of this in action. Specifically, Brian, if you were still in the real estate business today, how would you execute this strategy? The media company first strategy. Brian Clark: That’s a sore subject for me, because I have that and I’m too busy. See my answer to Bob. Robert Bruce: For people who may not know, what is that? Brian Clark: Yeah, YourBoulder.com has been going, I think, four years now. It reaches about 30,000 people out of 60,000 permanent residents in Boulder. I got an email list. You do searches for something Boulder-related, Your Boulder is going to show up. It’s a hyperlocal website built around lifestyle information, but it also has a real estate section. That’s what I would do, because that’s what I did. The thing I’m missing is a real estate license. I don’t want to mess around with ads and stuff like that, I just want to generate the leads and get paid the referral commission to the agents who handle the actual deal. That’s what I would do. And that is a media-first, an audience-first concept, just like we always do. The interesting thing about Your Boulder is — any local business, you could have that property market almost exclusively. For example, if I owned a restaurant in town, I could be promoting that restaurant all over the place. It would be amazing. If I had a plumbing service — any type of local business. I would pick real estate because I’ve done it before, I know how to make it work, and it’s lucrative. Anyway, go take a look at it, Dan, because it’s not a hypothetical — that’s exactly what I would do. Robert Bruce: You wrote a pretty comprehensive article about the hyperlocal model a few years ago. I think it’s time, maybe, to bring that back up. Brian Clark: All right, let’s put that in the show notes. I don’t remember where that is. Robert Bruce: I got it up. Brian Clark: You got it? Okay. Robert Bruce: It’s still there. Brian Clark: One of my old side projects. Brian Clark: I think people are figuring out that I do side projects to keep myself entertained, but I also learn amazing things from doing it. It would be nice if they all made a fortune as well, but that’s just not how it’s going at the moment. Robert, I may have … No, never mind. I’m not going to even say that. Okay. Brian Clark: We got to talk about this offline. Robert Bruce: I was going to say that I think that number was actually $275,000. That happiness number for pay check. Brian Clark: Oh, is that your revised number now? Robert Bruce: Well, you know, I’m just talking science. Brian Clark: I’m pretty sure the science said $75,000. Robert Bruce: Okay, you interviewed Mike Stelzner — Jeff refers to this in his next question — a couple of weeks ago, and Stelzner brought up his take on what’s basically happening with traffic and spreading of stuff on social, specifically on Twitter. You brought up a specific thing that we’ve been doing that contradicts what we had been doing up to that point. Do you want to talk about what Stelzner said and then where we are with that idea? Brian Clark: I do, but first I want you to talk about our sponsor. If you’ve got a WordPress site … You love WordPress. You love the power and flexibility of WordPress. But maybe you’re a little frustrated over the years. Things crack, things break, and you don’t have somebody on staff full-time to take care of the little things that happen. We’ve been building up to this for some time. Part of what StudioPress Sites is, is a taking care of all of that stuff for you, all of those frustrations for you without sacrificing everything you love — the power and the flexibility of WordPress. StudioPress Sites, it comes with our industry standard framework, the Genesis Framework for WordPress. The package — we have two plans that you can look at, but both plans come with 20 of our mobile optimized designs. All of the performance stuff that you’ve come to expect from both our hosting product, Web Synthesis, and everything that comes in Genesis — all of that performance is there. You’ve got zero hosting hassles with StudioPress Sites. We take care of it for you. The security you’ve come to expect from us in our other products, and of course, world-class support. If you love WordPress and you’re ready to take a little bit of a step up and get rid of all of those hassles that you may have been feeling here and there through the years with WordPress, check out StudioPress Sites at StudioPress.com. Brian Clark: Okay, when I interviewed Michael Stelzner a few weeks back about the state of social media marketing in 2017, he brought up something that I found really interesting. Mike said it was a new development in the algorithm over at Twitter. To sum it up, basically, Twitter knows you’re posting the same article 10 times a day, which has been the Guy Kawasaki strategy that most people follow. Mike said that the most popular happening — what’s the right word here? Instance, the most popular instance of you posting that all those different times, obnoxiously, is what’s going to show in the timeline to your followers anyway. Now, I have not been able to confirm this. I haven’t even tried. I trust Mike, obviously, but we talked about it at the next editorial meeting. I’ve always hated the fact that we post 10 times over at the Copyblogger @Copyblogger account. I don’t do that. It gets obnoxious. I have this really weird thing, Robert, about my Twitter timeline, how it looks. Repeat things right in a row. That’s probably psychotic of me, but I hate the way it presents, so we decided to change it. Robert, what are we doing now? Robert Bruce: All right, you guys discussed this new idea, and that was instead of re-posting … Sorry, you caught me. I was sneaking some coffee, man. Instead of posting over and over again, like you said, Stelzner brought up this idea that as far as he can tell with the algorithm on Twitter, it is more powerful to have a single Tweet gain more Retweets and likes than to repost that same content in separate Tweets over the day or over a period of weeks. So we’ll post a Tweet — basically, we’re asking people both internally and externally to share that Tweet. And there’s other things you can do. You can pin that Tweet to the top of your deal. You can Retweet it yourself. Brian Clark: Yeah, I just figured that out about a couple of months ago. I’ve realized that instead of re-posting something … Say, for example, I Tweet today’s Further and it gets five Retweets and 10 likes. Then, later on — it could be later in the day after I’ve posted other stuff or later in the week — instead of re-posting it I just Retweet myself. Brian Clark: You retain all the social proof that you accumulated, but it goes to the top of your feed where it happens all over again. I actually felt a little self-conscious about it. I’m like, “Does this look bad that I’m Retweeting myself?” but it’s better than the repetition of just hammering the same content in different Tweets. Brian Clark: You’re saying I am psychotic about my Twitter feed. Robert Bruce: I wouldn’t go that far. I would say those who might care about your … Really, what came to me was, treat your Twitter stream … The concept here that Stelzner brought up, it’s treating it the same way you would treat a blog post. You want a single, permanent, evergreen blog post on your site to gain as much traction over time as you can, so you keep pushing out that single blog post over and over again. Brian Clark: Yeah, it makes sense. We do not have any data on this yet. It’s something we literally have been doing about a week, week and a half. When our data ninja Lauren takes a look at things and can give us some conclusions, we’ll probably share them with you, I’m quite sure. But yeah, Jeff, that’s the essence of what Stelzner had found. If you go look at the Twitter account for Social Media Examiner, they Tweet their article of the day one time. We actually do twice to test an alternate headline much later in the day just to see what happens. But the primary Copyblogger article Monday through Thursday is Tweeted out, and that’s it. We’ll have to see what happens, because I’m not thinking about this. Generally why I talk to Mike every time I want to know what’s going on with social media is we use it, we depend on it, we have good size audiences, but I don’t want to spend my time thinking about Twitter any more than I’ve already admitted to on this very podcast. Robert Bruce: Yeah, right. You got a plane to catch, so two quick things on the way out here. Lori says that she’s currently listening to us discuss the merits of Facebook while, of course, she herself is on Facebook, very meta. Thank you, Lori. Stay away from Facebook is my advice. That’s my opinion. Brian Clark: How am I going to get material for these shows? Brian Clark: I still got to set up the new ask thing. It’s my bad. I owe you copy and questions directly from the email list. Brian Clark: Now, let me see if I follow you here. Robert Bruce: There’s no logic here. Brian Clark: You want me to stay away — you want everyone to stay away from Facebook. Robert Bruce: That’s right, yes. Brian Clark: Yet you want me to do live video on Facebook. Brian Clark: You don’t see a problem with that being a contradiction. Robert Bruce: Not at all. People aren’t logical. People are emotional creatures, they’re not logical beings, so that’s how this works out. Brian Clark: I got you. Okay. Robert Bruce: I think you should do Facebook Live. Yeah, I do. Brian Clark: Yeah. What does Gardner do? He’s doing another one, right? Today? Robert Bruce: Every Thursday at 1:00 Central. He’s just in his living room. Brian Clark: He announces he’s going to be there. He shows up, he says hi. A bunch of people are there. So he takes the questions right then? Robert Bruce: We also do a little pre … We set up a StudioPress.Blog/Live page, which is a submission just like your Ask page on Unemployable. There’s a submission form there. That page, obviously, is gaining. People are coming to it more and more. A certain percentage of those, of course, ask questions, but that’s the central page where people now know if they want to ask a question they can go there. Gardner tapping into — especially in the WordPress community — gets a lot of Live folks as well. So he also is answering — we’ll see what he does today — as many of those live questions as he can. He’ll come prepared with 10 or 20 questions, but then, yeah, people just bombard him. Brian Clark: It’s nice, because then they can ask follow-up questions. Like a live presentation Q&A, to a certain extent. Brian Clark: That may be worth doing. Robert Bruce: Today he’s going to focus on design. Next week he’s going to focus on content. And then at least once a month we’ll do an open mic Q&A, “ask me anything.” But we’re going to test and see how it goes with specific topics. “Hey, let’s keep this one today about design,” kind of thing. Facebook Live is — despite my personal problems with the company, it’s obviously a major platform and I think it’d be … I think you’d kill it. Brian Clark: All right, we shall consider it. Robert Bruce: There you go, Bob. Brian Clark: I’ll be with Jerod in L.A. Maybe we should do something impromptu. Robert Bruce: Yeah, just pop it up. Just test out a few low-key ones. That’s a great idea. Brian Clark: I’ll put Jerod in front of the camera and I’ll just throw things at him. Heckle him and see if he can keep his composure while answering live questions. That would be awesome. Robert Bruce: Do it. The other way to take this is — and I’m seeing a lot of these where people are setting up little mini-studios. They’ve got the background in their room and all that. Yeah, either/or. It’s so easy to just click the thing on, but you could also go a little more produced with it. Brian Clark: All right, dude. I have got to head to the airport. Robert Bruce: Have to go. Brian Clark: By the time people hear this I will be back, hopefully. That’s the plan at least. Then we’ll be recording another one of these next week, or on Facebook Live, I don’t know. Yeah, sorry. We’re going to cut this one a little bit short. I do have to run. I hope you have a great week. Robert, I hope you have a great week. I will get you your copy from whatever size jet I’m on. Robert Bruce: Thank you very much, sir. I appreciate it. All of us appreciate it. Thanks for having me here. Brian Clark: Yeah. Again, it’s a requirement. You’re loving it. Robert Bruce: I like being back. Brian Clark: All right, everyone. Thanks for listening. Keep going. You know the drill. Thank you for the transcript! I read soooo much faster than I listen, and that’s not just me complaining about Time Warner Cable again.